Give the gift of music! 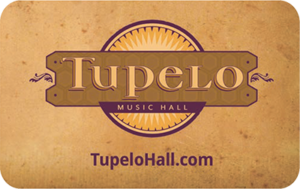 * Tupelo Music Hall gift cards can be purchased in increments of $25 ($50, $75, etc) by calling the Box Office at (603) 437-5100. Please allow 5 business days for mailing. *Tupelo Gift Cards can only be used towards tickets and memberships and cannot be redeemed towards food, beverage, or merchandise.